After wrapping up a multi-month writing project at work, I recently found myself in the mood to cook again. I wanted to make something that would test my skills as a cook and found just the challenge in James Peterson’s terrific article about veal demi-glace in the December issue of Saveur. 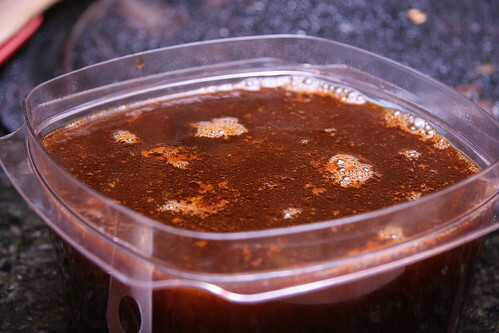 Demi-glace, meaning “half glaze,” is the foundation of all classic brown sauces. 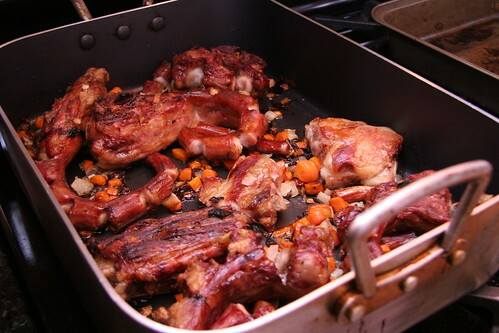 Fantastically meaty, salty, and savory, this thousand-times-reduced mother sauce is made from roasting, then simmering veal bones, carrots, and onions at an insanely particular rate of one bubble per second for 20 or more hours. In a professional kitchen with a team of well-caffeinated and trained cooks, I imagine this would be a breeze. For this untrained cook in her galley-sized kitchen with a hodge podge of cookware, it was a major undertaking. I knew that the 10 pounds of veal bones the Saveur recipe required to make a precious two cups of demi-glace would not be available at my grocery store so I called my farmer’s market meat vendor in advance of market day and asked them to bring the bones from their Virginia farm. When I arrived at the market, a tall bearded guy bundled in multiple layers to guard against the 20-degree chill pulled a bulky bag of frozen, individually-wrapped bones from the back of the truck. "How much are these?" he asked his buddy, who shot back a puzzled look. "Not sure," he said, fumbling for a list of prices. Clearly, this was not a common order. The entire bag set me back about $40. To complete my list of needed items, I found a 15-quart pot, large enough to hold the bones, at my local hardware store. The bag of bones ended up including more veal tail than veal bone, which may have resulted in a more gelatinous final product. However, 30 hours after I had roasted and simmered and reduced and strained and then reduced again, I finally had two cups of thick, dark brown demi-glace. I also had an apartment that reeked of veal. But no matter -- the unctuous sauce was everything Peterson said it would be – complex, meaty, and full of flavor. It was easy to see how this mother sauce could survive centuries and still be considered a centerpiece recipe in French cooking schools. When Paul and I tasted it again in the Bordelaise sauce I poured over New York strip steak a few days later, we both marveled at how the demi-glace lifted an otherwise ordinary sauce into the category of haute cuisine. We recognized the distinctly veal flavor instantly; we had had it 100 times in French restaurants but just never knew what it was. Heat oven to 500 degrees and, if you live in an apartment building or condo, turn OFF your fire alarm. 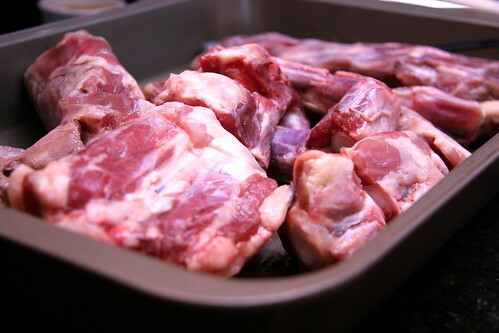 Spread the bones evenly in one layer in a roasting pan (unless you have an industrial size pan and oven, you will probably need two roasting pans for this many bones). Roast until brown about 1 hour. Add the vegetables to the pan and spread them evenly around the bones and roast until the vegetables are deeply browned, about 45 minutes more. 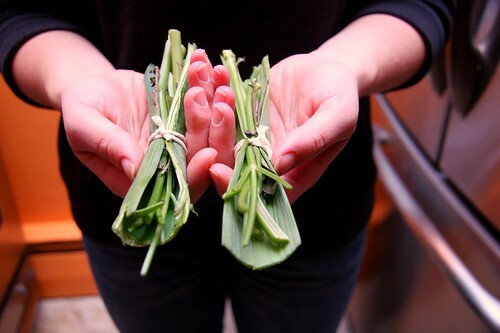 Meanwhile, make the bouquet garni by using the green outer leaves from the leek as a wrapper and inserting the parsley, thyme sprigs, and bay leaves in the center. Tie with kitchen twine. Transfer the bones and vegetables to a 15-20 quart stockpot. Place the roasting pan over two burners on stove over medium heat. Add 3 cups water to the pan and scrape up any browned bits with a wooden spoon. Simmer for 3 minutes; transfer liquid to the pot of bones. Add bouquet garni and tomato paste to the pot. Cover the bones with 6 – 8 quarts of water. Starting with cold water, set the pot over medium-high heat. When the first bubbles begin to appear on the surface of the liquid, reduce the heat to medium-low and simmer at a rate of one bubble per second for 20 hours. You're supposed to check the stock every few hours and add more cold water if necessary. And while that's possible during the day, it's not practical during the night unless you're willing to get up several times to check it, so you just need to make sure there is enough water to keep the bones covered throughout the night. 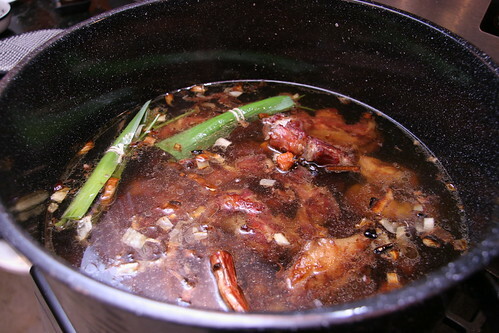 Skim the fat from the surface of the stock with a ladle every 5-10 minutes during the first hour of cooking to prevent it from clouding the stock. After the first hour, skim the fat from the stock periodically (the recipe calls for this every half hour but again, this just wasn't practical so do the best you can). When the stock is ready, strain through a chinois into a clean, 8-quart pot. 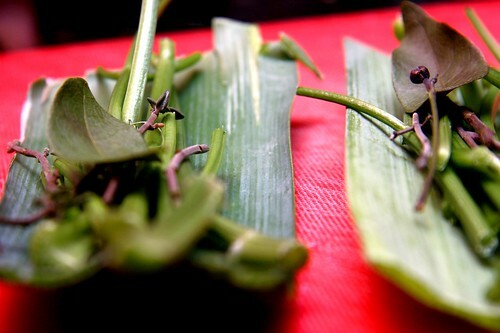 The bones can be re-used to make a lighter, secondary stock with fresh vegetables and aromatics, called remouillage. (Re-using the bones for this purpose was hugely rewarding and made me feel very French). Simmer stock for demi-glace over medium-high heat, skimming off the fat occasionally, for 4-5 hours until reduced to 2 cups. Turn your fire alarm back ON. Refrigerate for up to two weeks or freeze for up to 6 months. Wow Angela, this is fantastic. You made your own demi-glace. I used to make it using Anthony Bourdain's recipe. Yours look amazing. That's a lot of money and work for 2 cups but it looks fantastic...and it's worth just for that photo of the spoon. Great shot! Huge fan of Demi-Glace but never had the patience; may have to rethink as this looks scrumptious; lip smacking good pic's. Plus it made Tastespotting! Score! What a labor of love! It looks wonderful. I love his cookbook. Thanks, Elra! I'll have to check out Bourdain's recipe to see how it differs. Now that I know where to get the bones, I wouldn't hesitate to make this again. Joan: I'm glad you like the photo! 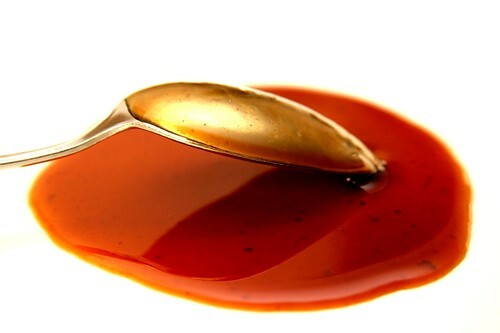 It is a lot of money for 2 cups of demi-glace but you can make several meals with that two cups since each sauce made from demi-glace, like Bordelaise, requires only a few tablespoons of the mother sauce. Butterball: You absolutely should rethink! It was such fun and not nearly as hard as I thought once I found a source for the bones. It just takes a lot of time so plan it for a long weekend. Thanks, Susan! It's definitely a labor of love. I think there might be a recipe in the Saveur cookbook for demi-glace but this one was from the December issue of Saveur. Just wow! I have wanted to learn how to make this demi-glace for the longest. Your pictures are simply irresistible! Thanks, Nazarina! Glad you liked the photos! I just finished this recipe yesterday and it's divided and in my freezer. My sauce is much darker, though, and I'm not sure that's a good thing. Love your writing! Kelly -- Thanks for the compliment on my writing; it's wonderful to hear! The fact that your sauce turned out darker is a good thing. Mine is a little too light. I think that's partly due to the way I photographed it and partly due to the fact that I should have reduced it about a half hour longer but had to leave for a party. It sounds like you did great! If you get a chance, try the bordelaise recipe I posted last week and let me know how you like it. Cheers! Hey, thanks for documenting. A great read and really good pics too! Nice one. Thanks, Omni and Chad -- I'm glad you enjoyed this one. It's a great winter project! Yours was the best (read easiest) recipe, and I only changed it slightly, adding two generous cups of a nice cabernet for deglazing and simmering, and about a 1/2 cup of dry sherry about an hour before it finished. A weekend's of work that turned out beautifully. Now that I have this beautiful, gelatinous masterpiece, now what? lol. I'm glad it turned out! I used it in several dishes, one of which was New York strip steak with Bordelaise sauce. This really looks and sounds delicious, and I agree with previous compliments on your writing. Beautiful blog! I found it via Tastespotting and will definitely be returning. However.. Saveur has steered you wrong. What you've made here isn't demi-glace; it's actually called "glace de viande." 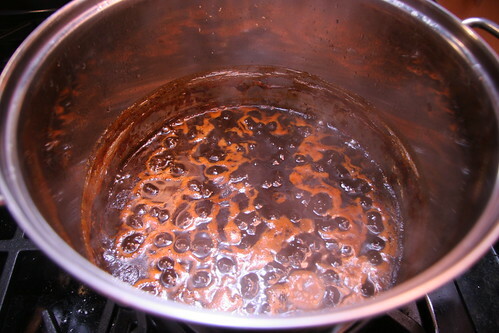 Demi-glace is made by combining equal parts brown stock and the mother sauce espagnole sauce (or brown sauce), then reducing this mixture by half. Making demi-glace only takes about two hours to make; some professionals consider it "the sixth mother sauce," some don't. Glace de viande is made by reducing brown stock by at least 75% (usually closer to 90%) to what amounts to brown stock syrup. There seems to be some confusion about the terms "demi-glace" and "glace de viande" - I googled both the Saveur recipe and Anthony Bourdain's. Bourdain appears to use the terms interchangeably, I'm not sure why, because they're not the same thing. It actually requires more patience to make glace de viande than to make demi-glace, so again, kudos to you for making what looks like an absolutely delicious one! A Chef: Great comment. Thanks so much for taking the time to clarify these terms. Much appreciated! I've been wanting to make a mother sauce for a while, but I've been struggling to find anyone near me in England to sell me veal bones. Pretty disappointing really. I'm going to another food market this afternoon, so fingers crossed. I had this recipe down as demi glace too, but I guess that it's because I've been reading Bourdain. Looking forward to making it. I'm planning to freeze it in ice-cube trays so I can easily add a couple of tablespoons to any other sauces. Thanks for your comment, Franz. Great idea to freeze the sauce in ice cubes. Good luck with sourcing the veal bones. I hope it works out!